Biotin is also known as vitamin B6. It is thus an essential element and without it, numerous processes in the body, including the metabolism of food, is sorely affected. 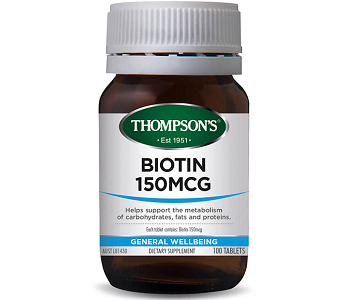 Unsurprisingly, Thompson calls their biotin ingredient by its other name, vitamin H. This comes from the German vitamin ‘haar’, the German word for hair. It was nicknamed like this when scientists first discovered the link between biotin and healthy hair, skin and nails. However, biotin as mentioned is essential for so many other reasons too. If you can’t get a proper uptake of vitamins, nervous system health, cognitive ability and much else is affected. Biotin is also known as the youth supplement because it affects aging over all; it has a regenerative effect thanks to the fact it helps to combat aging. This is a dosage that does exceed the daily recommended average; however it is much lower than what you’d find in other supplements. You will derive benefit but it may take longer to show. Often patients who have had cancer treatment, for example, take much higher doses of 5000 mcg or 10 000 mcg to ensure thick and new hair growth. Take one tablet daily with food or as prescribed by a health professional. Do not give to children. The manufacturer does not issue a specific pregnancy warning but the safety of taking biotin as a supplement during pregnancy has not been established, so avoid it or only proceed on doctor’s advice if you are pregnant or nursing. One pack size is 100 tablets. You cannot buy it from the Thompson product website and was also out of stock on Amazon with no price indicated and no indication of when new stock was expected. Thompson’s makes no reference to a guarantee or refund policy that we could find. This means you would probably have to abide by the policy of a third-party reseller. The product contains no gluten, lactose, nuts, shellfish, sugar, dairy, egg, fish, sesame seeds, soy, artificial ingredients, colors or flavours. It is vegetarian and vegan friendly. However, we are hesitant to recommend this product because firstly, it is not clear where the supplement is obtainable, if it is obtainable and at what price. The price point will be critical because there are many supplements offering a higher dose of biotin, so the issue is one of measuring value. This value needs to be measured not just regarding the price of one bottle, but the cumulative effect of taking it over an extended period of time. When equating value, take into account not only one-off discounts but various pack sizes, subscription offers and bulk discounts.